"It was on the mourn That I saw a ship a sailing The sea was..."
"So sorry to hear of your dad's passing. 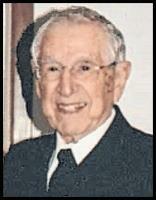 He was a gentle..."
Captain Ralph Harold Laedtke, MSC, USN, Ret. passed away at home in Washougal, WA on March 12, 2019. He was 98 years young. He was born to Alma and William Laedtke on October 1, 1920 in Appleton, WI, the eldest of five children. Ralph joined the Navy in September of 1939 as a Seaman Recruit and served his country for nearly 35 years. He was stationed aboard the Hospital Ship Solace during the bombing of Pearl Harbor and was aboard ship during several WWII battles. He was stationed aboard the USS Oriskany during the Korean Conflict. Some of his duty stations included Norfolk, VA; Bethesda, MD; San Francisco, CA; Great Lakes, IL; Charleston, SC and Guam. On Thanksgiving evening, 1944, Ralph married Ruth M. Koch in Oshkosh, WI. She was a dedicated Naval wife and loving mother. They were married nearly 63 years and had three daughters: Carol (Ron Parkey), Lois and Martha (John Brennan); grandchildren, Matthew, Nathaniel, Susannah, Emily, Andrew, Hannah and Will; as well as several great-grandchildren. Surviving siblings are his brother, Glenn; sister, Arline Sitter; along with numerous nieces and nephews. After retirement from the US Navy, Ralph taught Health Care Management at Chicago Medical School and in 1978 became Coordinator of 2 off campus programs for Southern IL Univ Carbondale. In retirement, Ralph was a member of the Libertyville Sunrise Rotary Club, the Pearl Harbor Survivors Association and the Gideons. He was an avid Scrabble and Cribbage player and enjoyed playing golf. After the death of Ruth in 2007, he married Ferne M. Bottemiller Facey and was married to her nearly 10 years. Shortly after they married, they moved to Washougal WA, where they lived with Ferne’s daughter. Ralph was much loved and tenderly cared for by Ferne’s daughters, Lauri (John) and Ruth (Mike) and their families. Ferne passed away in July 2018 and Ralph continued to live in his home until his death. Ralph was a man of great faith. He was a lifelong Lutheran and a faithful member of St. Andrew Lutheran Church in Mundelein, IL and later Zion Lutheran Church in Camas, WA where he was a “honorary” member of the quilters and involved in many groups. A memorial service will be held on Saturday, March 23, 2019 at 11a.m. at Zion Lutheran Church in Camas, WA. Memorials may be made to Zion Lutheran Church Endowment Fund, 824 NE 4th Ave., Camas, WA 98607.